It is known by many as the document that ultimately resulted in modern democracy. So why are there so many versions around of Magna Carta? "People imagine that it's going to be really pretty, and that it's going to be an illuminated manuscript, and it's not, but that's really interesting because it's a working document," said Geoff Pick, director. "It was a negotiated peace treaty between warring sides." It is not the only one that is on display of course - there are in fact 17 copies of the Magna Carta which are known to have survived over the years. The document was a peace treaty first agreed by King John in 1215 to appease rebel barons in the heart of battle. Once the treaty was agreed, identical versions were copied out and sent to legal and religious officials across the country to make sure it was carried out. About 250 copies were created, however it is impossible to know the exact figure as no official list was created. The ones which have survived are on display in places including Salisbury Cathedral, the British Library and the Bodleian Library in Oxford. Magna Carta was reconfirmed six times by kings following conflicts with barons and would often be used by monarchs as a bargaining tool for more tax to support their military campaigns. It was "I'll reconfirm Magna Carta, if you let me do something else," says Mr Pick. Although there are many versions around, Mr Pick argues that the one the London Metropolitan Archives team looks after for the City of London Corporation is the most important. This version, from 1297, is of historical interest because the king at the time, Edward I, allowed it to be confirmed in Parliament, meaning it was copied into the statute rolls and became law. From that point, if a king wanted to change Magna Carta, he would change statute law, requiring the consent of Parliament, rather than reissuing the document. But when you see it, what are you looking at? The first thing to notice is that this version is near perfect; it was not damaged in the Great Fire of London, and it has been preserved over the years. Other versions have rips, smudged writing and in some cases, fire damage. It is very neat as it was written by professional scribes and it is in Latin. As a formal document, it follows the layout of a royal charter which starts with the name of the monarch (in this case Edward I) who reissued it. The document is written on parchment - which was known to be long lasting. "That's why if you look at so many, they all look slightly different because they all used different bits of parchment," says Mr Pick. "There was no template." The modern way to authorise documents is to sign them, but at that time it was not common place, so Magna Carta was never signed by King John. Therefore the way a document is proved to be official is in two ways - it has the royal seal and there has to be witnesses. The higher the status you are, the higher the status of your witnesses. In this case, the charter was witnessed by King Edward I's son, the future King Edward II. "If it was written as a nice word document now, it would say: "I'm Edward, King of England etc, I have inspected the charter of my predecessor Henry. Here is the charter and at the bottom, I confirm its contents and my witness is Edward, my son," said Mr Pick. This copy, from the Corporation, is different to the other versions because it has an added piece of parchment sewed on top. This is not a correction, says Mr Pick, but it is the writ of the instructions to the sheriff of London - the senior legal official at the time - to make sure that Magna Carta was carried out. Another way this one differs from the other copies is that it confirms London's ancient customs and traditions. "It doesn't say what they are - there are other documents that say that, this confirms those - but it basically says it's business as usual and the monarch will not interfere." For the first time, it also sets out that London should have a mayor - something which still plays an important part in modern life. 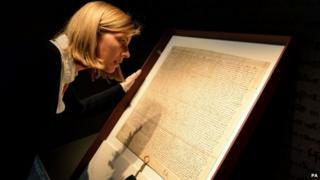 Magna Carta will be on display at the Heritage Gallery at the Guildhall Art Gallery from Friday.